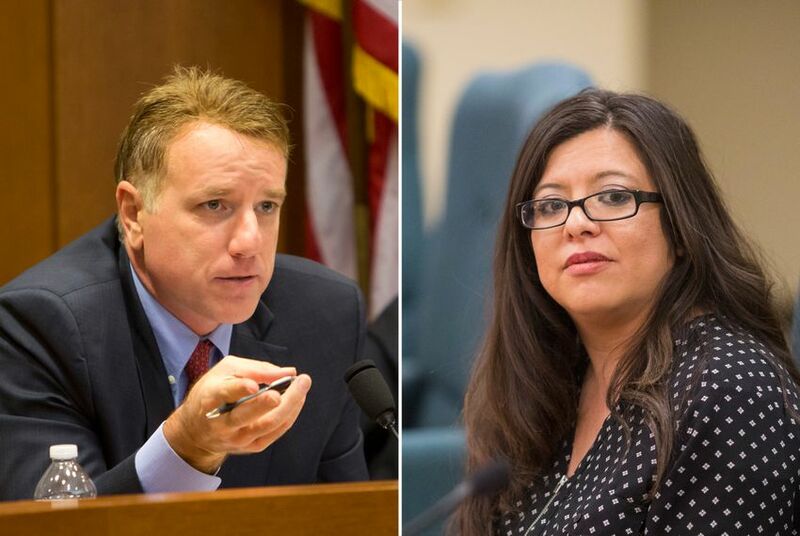 Rep. Mary González on Wednesday said Republican state Rep. Pat Fallon has apologized for his remarks before a Wichita Falls group. State Rep. Mary González said Wednesday that a Republican colleague who publicly mocked her sexual identity earlier this week has apologized to her. González, a Democrat from Clint, identifies as pansexual — someone who is attracted to other people regardless of gender or sexual identity. On Monday, state Rep. Pat Fallon, R-Prosper, told the Wichita County Republican Women that Democrats were dividing Americans by class, race, gender and ethnicity, the El Paso Times reported. Then he brought up González. “There’s something called pansexual now," Fallon told the group, according to the newspaper. "I don’t even know what that is. Suffice to say, secure your cookware." González, who was first elected in 2012, told The Texas Tribune on Wednesday that Fallon called her to apologize that afternoon. Fallon told the Tribune on Wednesday he regretted making the comment. "I was making a point about how labels are not important and absolutely should not have mentioned, or even alluded to anyone, specifically. It was wrong to bring her in to this," he said. "She's a great representative. Obviously we have our political differences, but she's always been a wonderful person and I regret that she was hurt and I regret my comment." González said she accepted the apology and will continue working to represent everyone in her district. "Since I've been elected, I've worked really hard to represent my wonderful district on issues like education, economic development and agriculture," she said. "At the same time, I still understand that I want to model the leadership I feel Texas needs, and that is leadership that is inclusive and recognizes the history of discrimination of marginalized communities in this state. This isn't the first time someone has said something about my identity, but I am still going to take the high road and work with everybody and fight for my district and Texas." González has always been open about her sexuality and has been a champion for the LGBTQ community since before her 2012 election. During the primary that year, she said she owed it to the voters to be open about who she was.